The Perfect Employee: Like a Chinese Truck? If you had to imagine creating the perfect employee, in this age of advanced robotics, you might imagine a tireless, multitasking, uncomplaining, absolutely dependable, sleek stainless steel humanoid robot. But, a primitive truck that looks like a camping generator on wheels? The impact on me of seeing one of these ungainly workhorse Chinese trucks for the first time was strong, yet subtle. Even now, when I step outside onto the streets of Yangshuo (where I have been ensconced for a couple of weeks), these ubiquitous rural trucks look comically out-of-date—if not utterly obsolete—and overly transparent, yet somehow deserving of great respect. 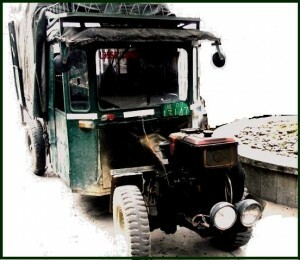 The lingering impression is that if it were an employee, a “Tuo La Ji” (“Drag Pull Machine”) truck would make a great role model for other employees—especially in China, and maybe also everywhere else. The TLJ, with its entirely exposed front-mounted lawn mowerish motor, like a confident, yet humble office assistant, is literally “upfront” about what it is and isn’t: It isn’t about looking or sounding cool or putting on airs. Transparent and unglamorous, the delivery-sized truck, which can be heard before it is seen, sounds and looks a lot like a putt-putting Ford Model-T. If you are deaf or otherwise don’t hear it, you’ll generally smell it—to the extent that its diesel exhaust meets international emission standards, they are only 19th-century industrial England’s (which is why TLJs are not allowed on the streets of many major urban areas). Nor is it about being anything like a Wall Street broker—trendy, cutting-edge, ultra-modern, sophisticated, envied, rigged out with status symbols, upwardly mobile, ostentatious, high-powered or well-equipped with all of the latest techno-bells and whistles to match a hustling accountant’s iPhone 5 and iPad. In short, the Tuo La Ji is no yuppie or up-and-coming millennial. Manufactured in 3-wheel as well as 4-wheel versions, and rapidly being replaced in urban areas by much sleeker, more sophisticated and powerful Chinese urban “yuppie” trucks, even the oldest TLJs embody some of the best attributes of employees, as well as of trucks and tractors. An employee who is like a Tuo La Ji will be incredibly reliable, even when severely tested. 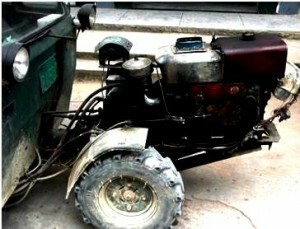 Entrusted with the economic survival of farming families and construction companies, the truck is an unfailing stalwart. Like the ideal employee, the TLJ is also quite affordable: starting at around 10,000 RMB ($1,666). The perfect employee will also be as uncomplicated and low-maintenance as the Tuo La Ji: Both will have minimal needs and requirements. Because of the simplicity of its design and motor, maintenance of the TLJ is simple and inexpensive. 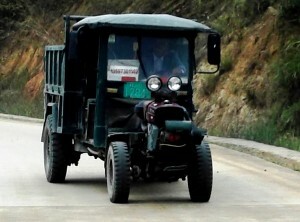 As for multitasking and multi-purposes, not only does the TLJ perform multiple tasks, such as field plowing (in place of a water buffalo), rice threshing (when its motor is harnessed to the right auxiliary equipment), transport, marketing and sales (as a mobile sales kiosk), it also performs these tasks in a kind of “vertical integration” of the economic production, transport, distribution and marketing processes. How many human workers besides farmers do that?—work to produce the raw materials of a product, process the product at some production stage(s), transport and deliver the product, and then market it. Try to imagine a single worker at IBM mining the metals for a computer chip, soldering, wiring and embedding the chip in a computer, transporting and delivering the finished chips or computers to a retailer and then working in an IBM store as a salesperson. Essentially, that’s what the TLJ (and many a Chinese farmer) does and what the perfect employee would be capable of doing (and thereby reduce the complexity and size of an enterprise’s workforce). The exposed TLJ motor can teach us something else about perfect employees: The unshielded motor stays cool in virtue of being exposed directly to the air. This means that image is sacrificed for performance. A perfect human employee would be one who, when offered the choice between having a nice private office with an oak door and huge potted plants, or synergistically working closely with his team in a common, nondescript room, would opt for the latter. Performance über image. Like a toiling human workhorse, the TLJ elicits something like pity (for its primitive ungainliness) mixed with respect—even also pride in having one on one’s team. That’s the kind of respect and pride that the perfect human employee would elicit. As for the pity, there is a place for that too. It’s a pity that such perfectly vertically-integrated employees are rarer here at home than the Tuo La Ji is in China.